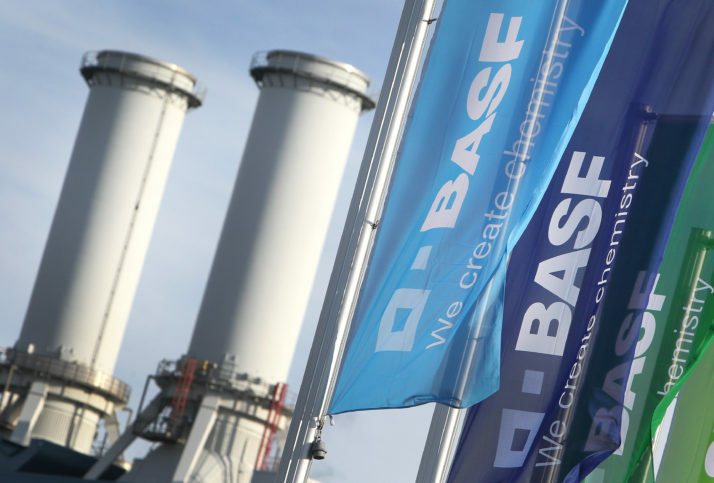 Europes most hallowed principle of consumer protection is under siege after a big lobbying push by an organization representing the likes of U.S. oil giant Chevron and German chemical powerhouse BASF. Since the early 1990s, Brussels has used the “precautionary principle” as its guiding light to regulate products ranging from paint strippers to driverless cars and genetically modified crops. Washington has long condemned this EU framework as a form of protectionism that allows policy makers to err on the side of caution to protect the public and avoid environmental damage when the science is still in doubt. Now, some of the worlds traditional heavy manufacturing industries are trying to introduce a new way of thinking into the game through a competing philosophy: the innovation principle. The intention is to grant companies broader leeway to bring products to market because of their significance as a scientific advance. There are signs this new approach is gaining traction in Brussels. In the European Parliament on Wednesday, lawmakers voted on a regulation that includes the innovation principle in EU law for the first time. Emails, letters and technical papers seen by POLITICO show how a consortium of the worlds largest mining, energy and agrochemical companies — including a company with a nickel mine in the heart of Russias most polluted industrial city — have led a years-long campaign to lobby the EU to adopt the new innovation principle. “The chemical industry came up with it to pave the way for laxer market authorization of often risky products like chemicals, pesticides, pharmaceuticals, and products of new genetic engineering techniques,” said Nina Holland, a campaigner at Corporate Europe Observatory, a campaign group whose aim is to underline the effect of corporate lobbying on EU policy making. The principle has previously appeared in EU strategy papers, but has not been brought into law. Some lawmakers have made a last-minute push for Parliament to remove any mention of the innovation principle. The concept was first introduced by the European Risk Forum (ERF), a Brussels-based think tank, in October 2013. Its aim? To ensure that “whenever legislation is under consideration its impact on innovation should be assessed and addressed.” Supporters of the principle say that such an approach would be useful as Europe needs to weigh up approvals of a host of new digital technologies such as watches capable of warning people when they are at risk of having a heart attack. Hundreds of documents shared with POLITICO by Corporate Europe Observatory reveal a five-year campaign spearheaded by the ERF, whose members include the U.S. oil giant Chevron, Russias largest precious metals producer and pesticide producers like DowDuPont, Bayer and BASF, to convince officials in Brussels about the benefits of the new philosophy. For ERF, its a matter of striking the right balance. 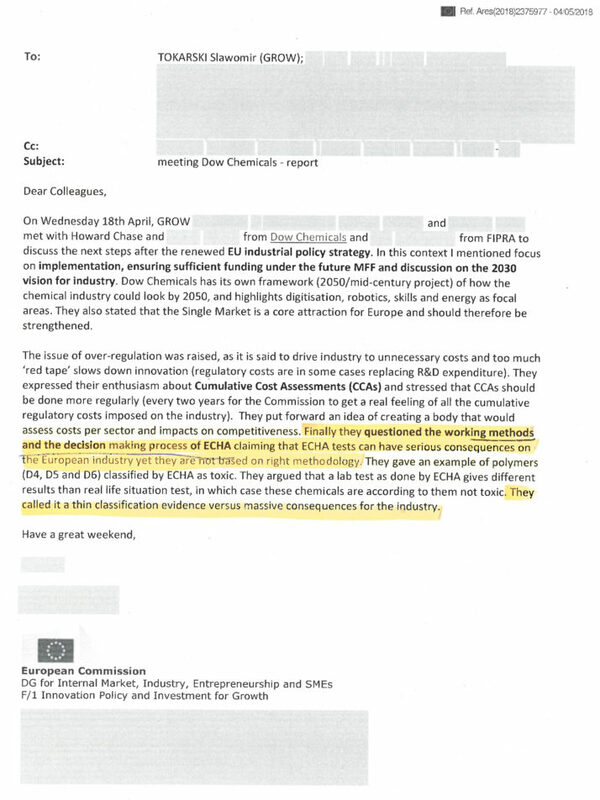 In an email from May 4, 2018, Slawomir Tokarsi, the European Commissions director of Innovation and Advanced Manufacturing, described a meeting with ERF members Dow Chemical and FIPRA, a public affairs consultancy, in which the company executives “questioned the working methods and the decision-making process” of the European Chemicals Agency (ECHA). Assessment conducted by the EU chemical watchdog “can have serious consequences on the European industry,” the summary report said, relaying the views of those in the room. 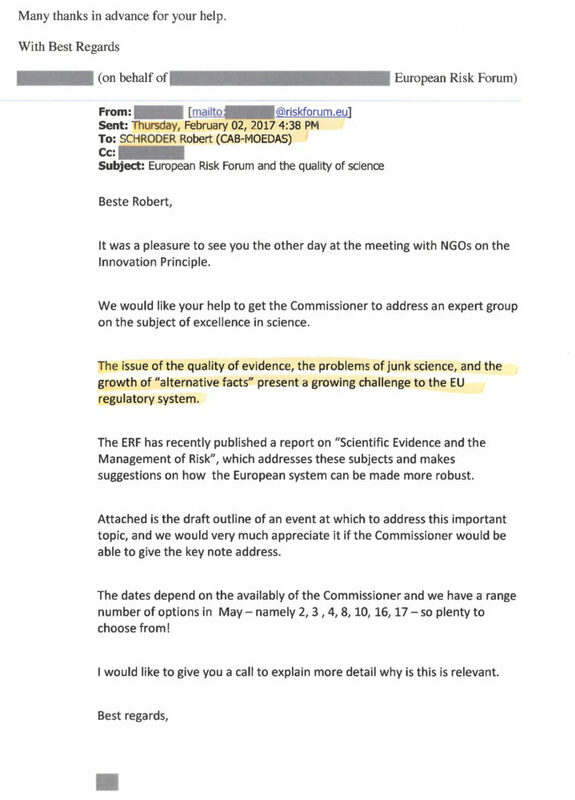 A February 2, 2017 email from an ERF executive to Robert Schroder, a member of European Innovation Commissioner Carlos Moedas cabinet, dubbed scientific studies with views that go against that of industry as “junk science.” It went on to argue that “the growth of alternative facts present a growing challenge to the EU regulatory system.” The documents also reveal several successful attempts to invite Moedas to dinners and high-level conferences on the innovation principle. Should the Horizon Europe text win final approval from EU institutions, it would mark a major coup for industrial heavyweights. “Industry has very cleverly and quietly managed to get something that sounds like it could be legitimate into mainstream thought. You know: whos against innovation, growth and jobs?” said Geert Van Calster, a professor at the University of Leuven who co-authored a paper on the dangers of the innovation principle. “Its a very narrow group of industry which has been frustrated with the precautionary principle,” added Kathleen Garnett, who co-authored the critical report on the innovation principle. Corporate lobbyists also argue that this would boost innovations that could be used to tackle problems facing the planet such as decreasing the impact of animal feed on the planet. Paul Leonard, director of global government affairs for BASF, the German chemical company, cited a new canola-based fish feed developed by his company for salmon, which contains high levels of omega 3 fatty acids. “Right now, for every kilogram of salmon you eat, youve had to basically dredge up three or four kilograms of fish in the South Atlantic to feed it to the salmon. Thats not good for the environment, its not good for the penguins, the sea lions or anyone else,” he said. The product is waiting for approval in Europe but already approved in Latin America. “The two principles should complement each other, recognizing the need to protect society and the environment while also ensuring Europes ability to innovate for societal benefit,” said József Máté, a spokesperson for Corteva, the agricutural division of DowDuPont. Officials at Chevron and Bayer did not respond to questions. This story has been updated following the European Parliament vote.